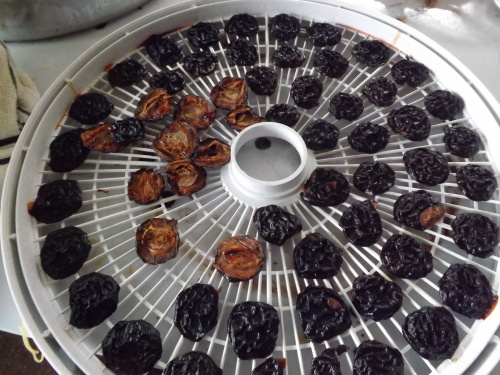 Besides canning plums for future consumption or projects, the other two methods of preserving them would be to either dehydrate or freeze them. With so many plums this year, I was able to try both methods. 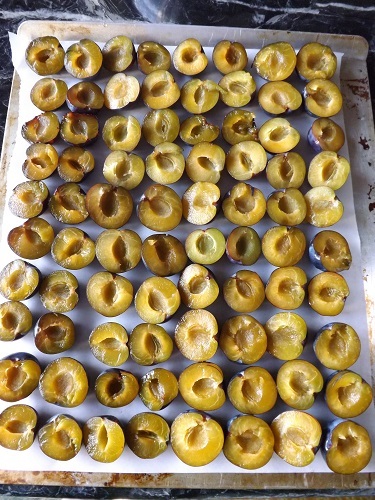 To find out about dehydrating plums see my post Dehydrating Damson Plums at Simply Grateful Canning. 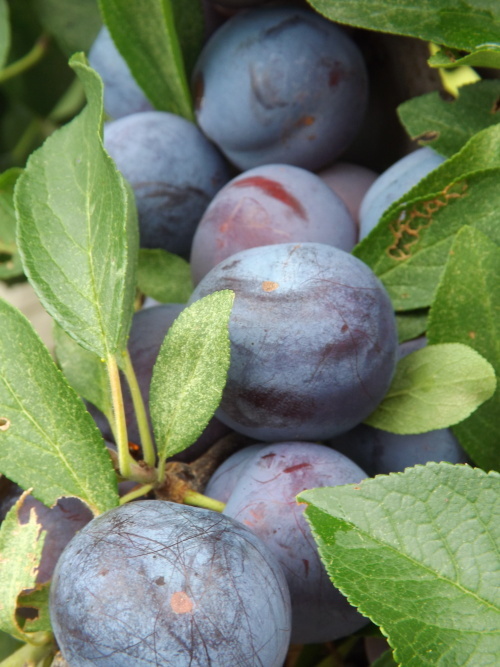 To find out about freezing plums check out Freezing Damson Plums also at Simply Grateful Canning. Getting down to the nitty-gritty with the plums. 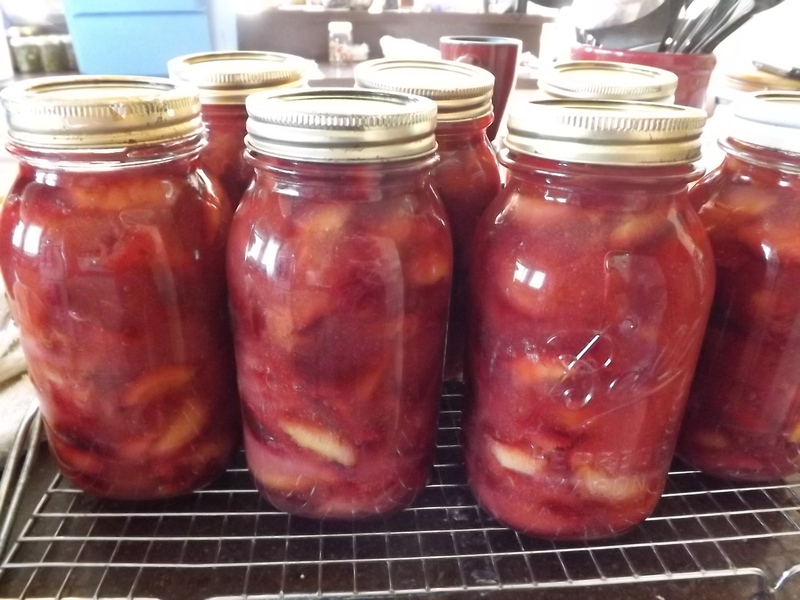 I have only one more canning project to post and then a really cool recipe using either fresh or frozen plums inspired by a dish my mother-in-law used to make for Hubby which was a recipe from his grandmother. Posts coming soon! The excitement of almost being done with the plums is overwhelming. I can hardly sleep just thinking about not having a single plum to pit for another year. Of course for weeks I couldn’t sleep just thinking about all the plums I did have to pit, so maybe it’s just that I can’t sleep — the wonderful effects of menopause…but we’ll save that for yet another post. For now, we are down to about five pounds of plums and counting, and for this I am — Simply Grateful. A juice is extracted by heating fruit and then straining out the pulp. It is thin and often clear. A nectar is obtained by heating fruit, pureeing it, and running it through a food mill to extract any skin and seeds/pits. The final product is thick with pulp. A cider is produced when juice is extracted from fruit by cold pressing and the end product is not heated or pasteurized. 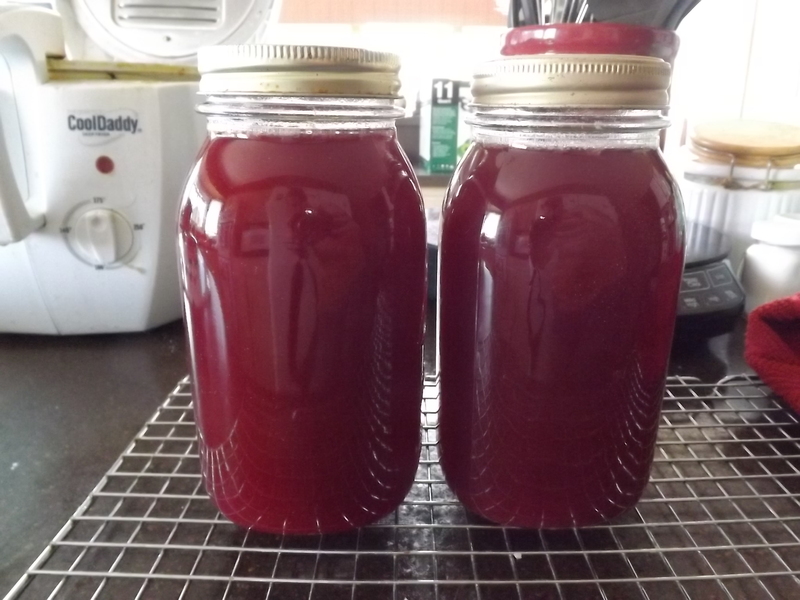 This year was the first time I ever made nectar, see my post on Simply Grateful Canning for Plum Nectar and once I made one, I couldn’t wait to try others. There will be posts on several more in the next couple weeks. Although cider is certainly my first choice in processing methods for fruit, nectar runs a close second because it is so substantial in fruit and flavor. Something new for the pantry, and for this I am — Simply Grateful. One aspect of canning that I never get tired of is the fact that no matter how long I’ve been doing it, there is always something new to learn. 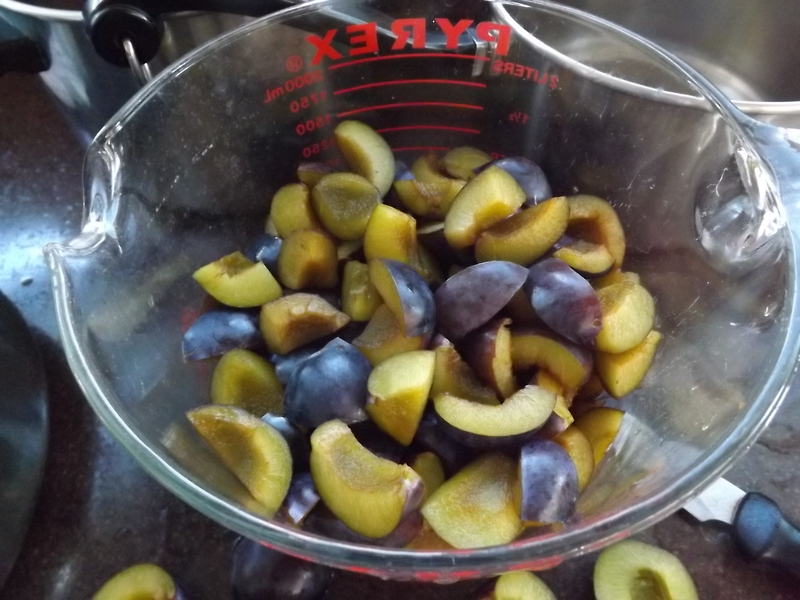 This year while canning whole plums I decided to take the time to test hot packing plums versus raw packing them. 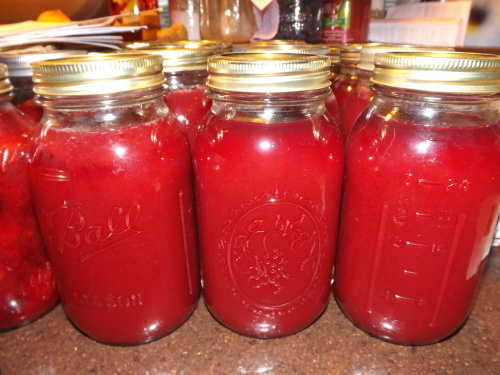 The results were surprising and enlightening, see today’s post on Simply Grateful Canning on Canning Whole Plums. I am so glad I took the time to find out why one method might be better than the other and didn’t just take the quick, easy route (raw pack). Had I done that, I never would have realized that there is a better way and the reasons why it is better. I never get tired of learning new things, and for this I am — Simply Grateful. 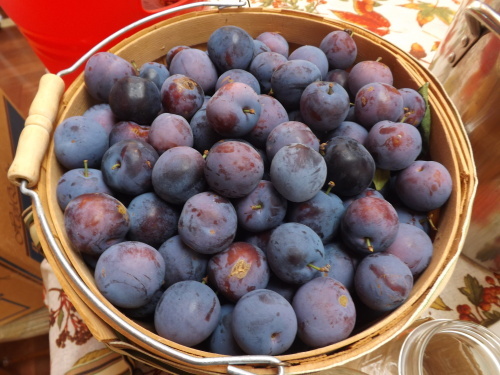 Plums, Plums, And More Plums — The End Is Here! 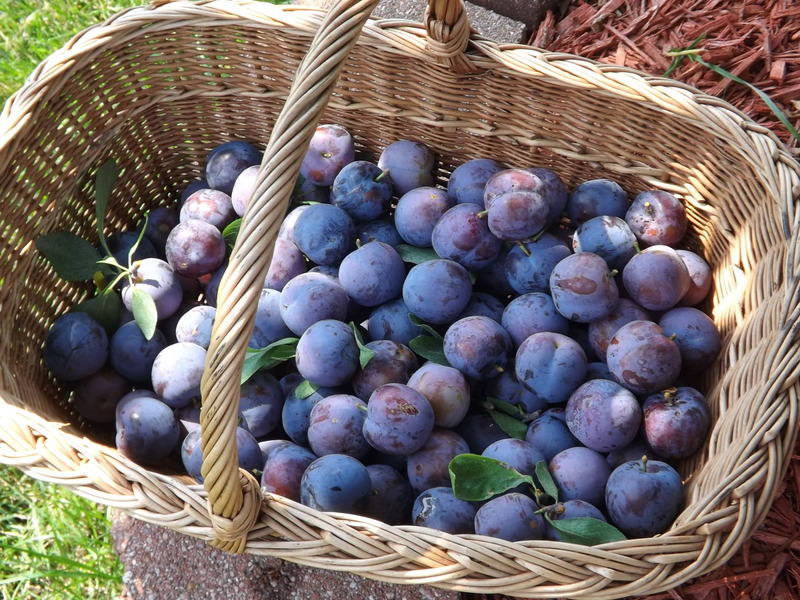 Hard to believe, but I finally finished picking the last of the plums from our plum tree this afternoon. Grace and Zeb helped me drag the 10-foot ladder from the garage and after two and half hours we’d picked the final 29 pounds and two buckets of rotten fruit. The one drawback to having a plum tree is how much work it is. 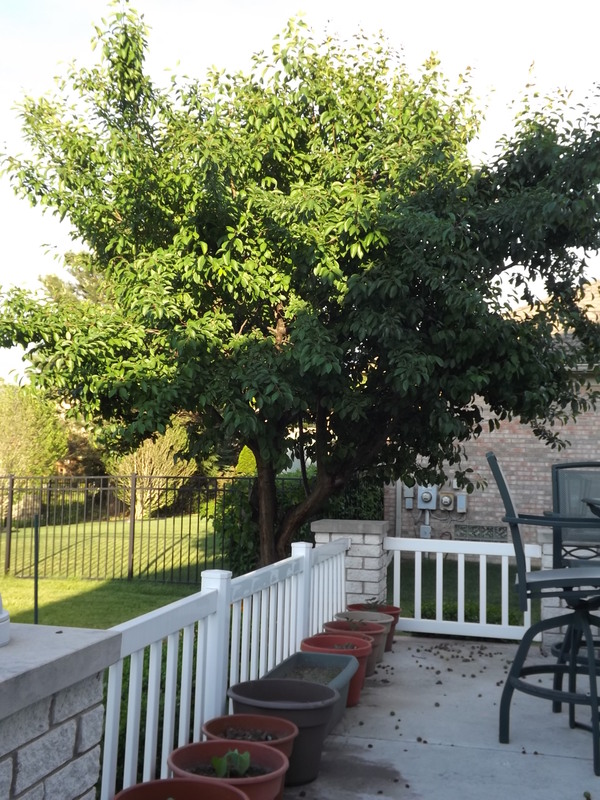 Plum trees are very susceptible to a fungal infection called Brown Rot and of course our tree has it. Our tree has had it for at least 10 years now, yet we are able to control it and actually get an unbelievable amount of fruit from our little tree. This year we harvested 153 pounds of usable fruit and I have canned all but about 15 pounds that we were able to give away and the 29 pounds we harvested today — recipes certainly to follow. Harvesting all this fruit took about two weeks, four ladders, four lawn bags for pruned branches, six 5-gallon buckets for rotten fruit, more baskets, bowl, and containers than I can remember, and more hours than I want to think about. 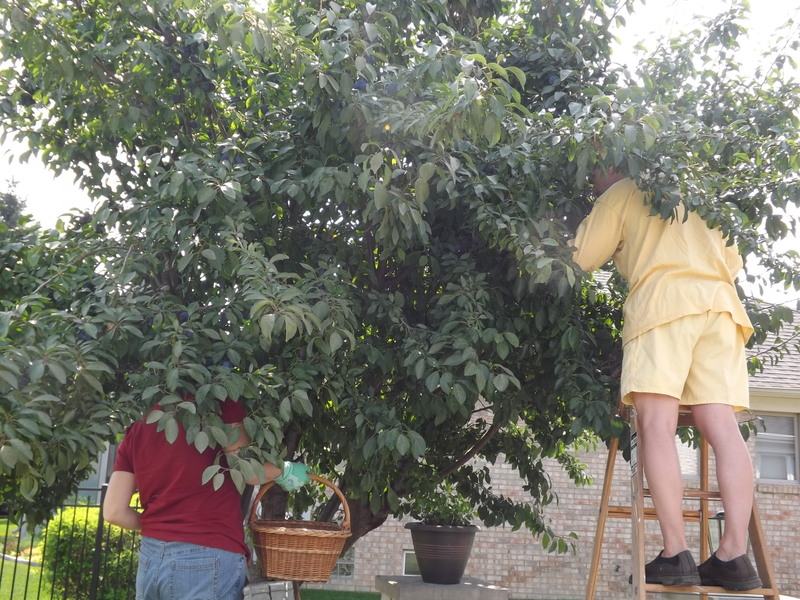 Having a plum tree is a labor of love and dealing with the Brown Rot is certainly a challenge (see today’s post on Simply Grateful Gardener Keeping Your Plum Tree Healthy — Dealing With Brown Rot), but the bounty is our reward. I am so happy plum picking is done. As much as I love all the plums and the bounty we were blessed with, I also love not having all the work involved with maintaining the tree hanging over my head for another year — and for this I am — Simply Grateful. 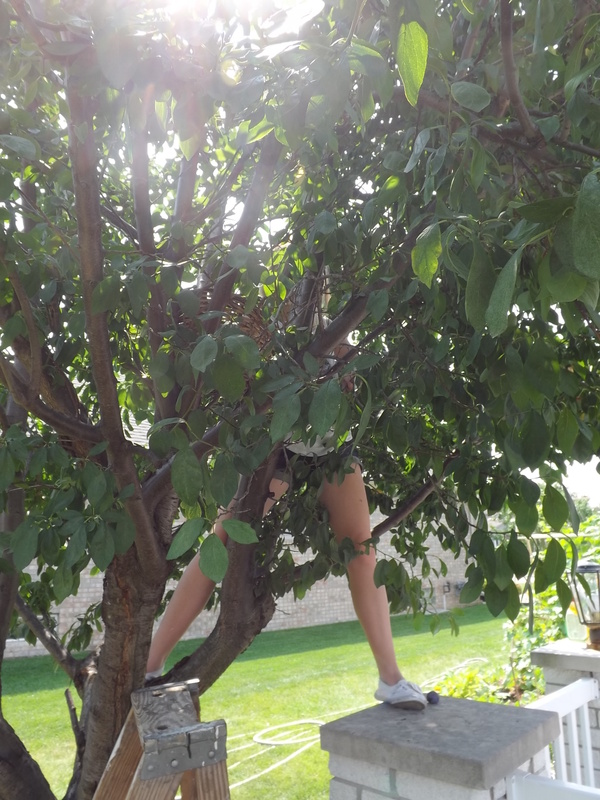 Having our own plum tree can be both a blessing and a curse. A blessing because over the past two years we harvested more than 400 pounds of fruit, a curse because over the past two years we harvested more than 400 pounds of fruit and more than 200 of it had to be canned or processed. Last year we only had about 85 pounds of usable fruit to work with, but seeing as I still had plum pulp and juice in the freezer from 2013, I wasn’t about to complain. Our whole family loves plum everything. 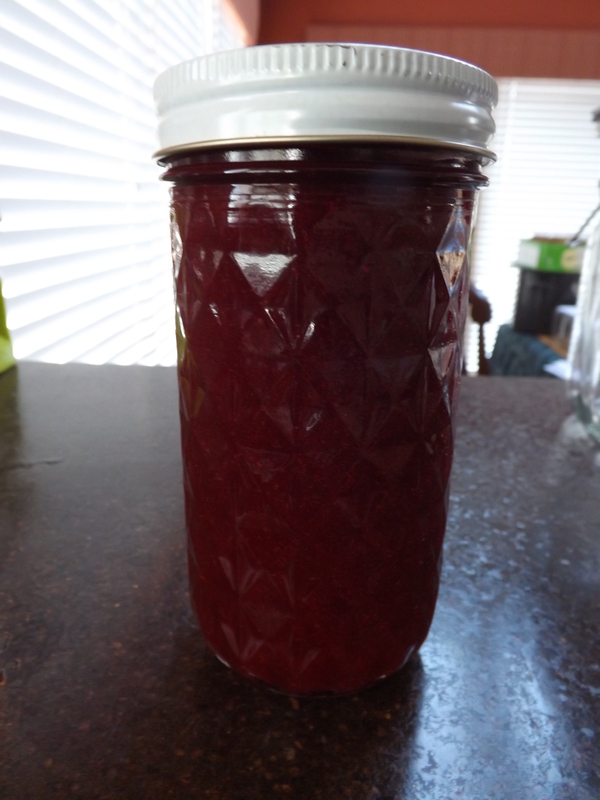 I make jam, jelly, preserves, juice, pie filling, can the whole fruit, and even dry them and make plum fruit leather. Still, with so much fruit, the freezer quickly filled of containers of fruit and pulp that I had to save for another day. Today was that day. Having a wonderful stockpile of cranberries in the freezer to keep me happy until next October when they once again will be sold locally, I decided to use some of them to make homemade cranberry sauce. 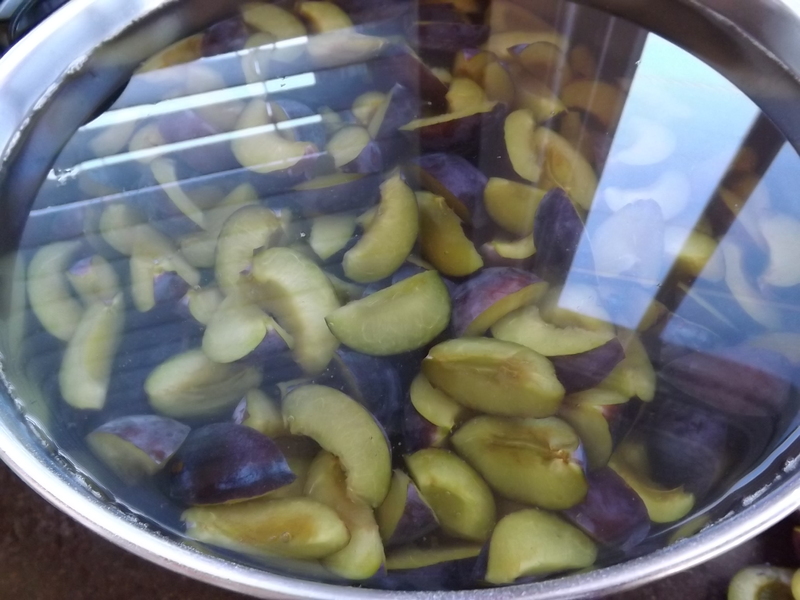 Not wanting to miss out on an opportunity to improve upon an old favorite, I decided that rather than use the “water” the recipe called for, I would use plum juice. 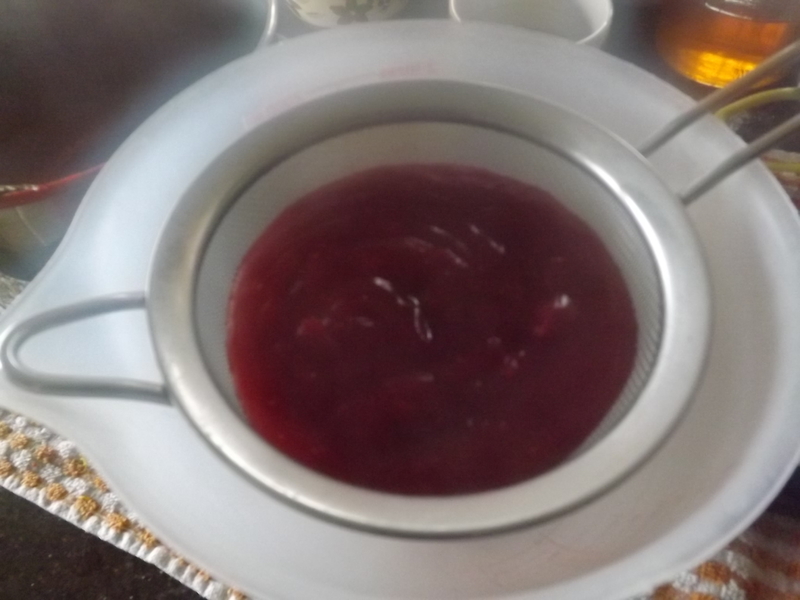 What a great way to utilize the abundance of plum juice in the freezer and make our cranberry sauce even better. Rinse and sort cranberries. 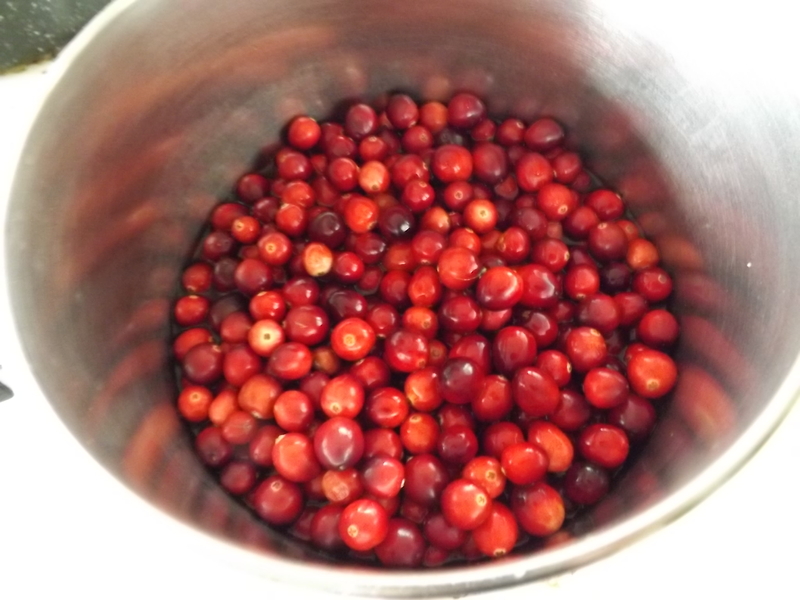 Combine cranberries and plum juice in large stock pot and slowly bring to a boil. Boil for 10 minutes covered, allowing the cranberries to pop. Remove from heat. 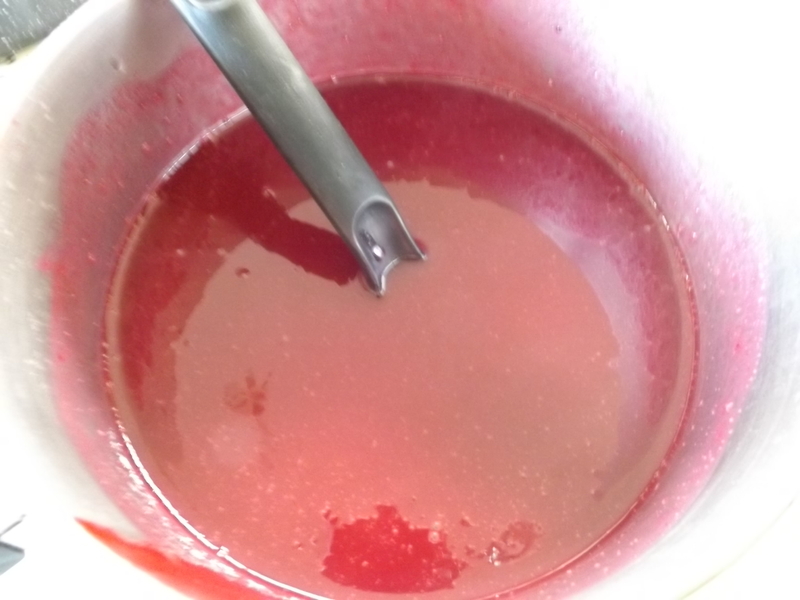 Using a stick blender, puree the cranberries until the mixture is smooth. Pour liquid into a mesh strainer, removing the seeds and skins from the sauce. Return the strained sauce to the stock pot and add the sugar. Stir over medium heat until sugar is dissolved. Slowly stir in Clear Jel slurry and increase heat to medium-high. Bring to boil and boil hard for one minute. Remove from heat and ladle into hot jars. 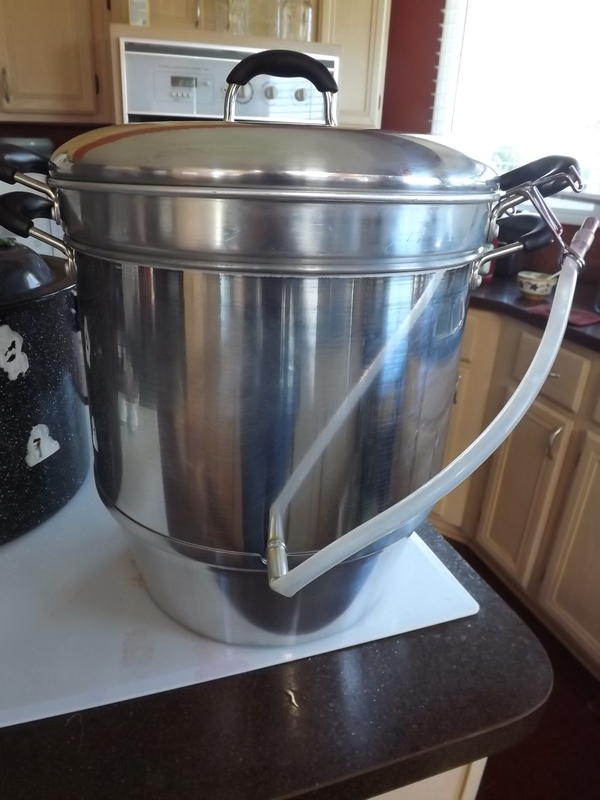 Process for 20 minutes in water-bath canner. This recipe yields 5 – 12 oz. jars and 1 – 8 oz jar. This particular recipe does not make a cranberry sauce that is jellied as those in the stores. It is smooth and spreadable. Not jellied enough for molding or slicing. We especially like using this sauce on turkey burgers and pork, or even spreading on chicken like barbecue sauce. It is sweet but still tart and the plum juice adds a subtle undertone of fruity flavor that makes this a great staple to have on hand for all sorts of meals. 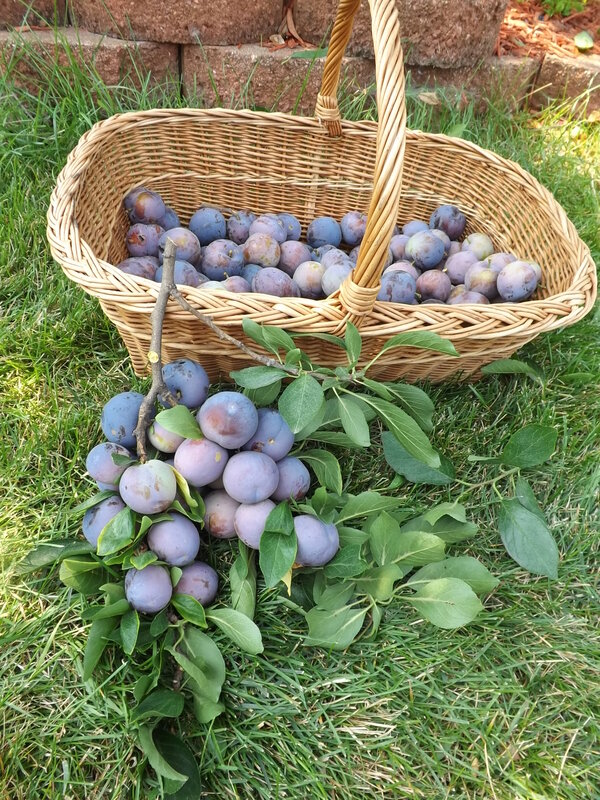 An over abundance of plums might be a lot of work and at times may seem like a curse, but actually I am very grateful and love every minute of it. From the first bud in spring, until the last plum is harvested, to the first taste of juicy fruit, and finally the last drop of juice frozen, I am Simply Grateful. Using every last plum from our plum tree this year was a challenge, but it did give me reason to experiment with several new recipes. 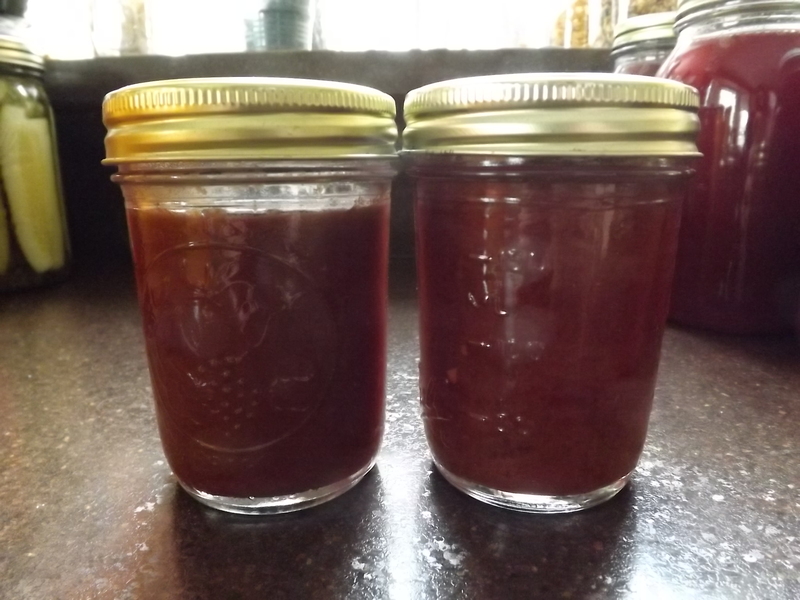 This recipe for plum barbecue sauce turned out really good according to Hubby. I’ve yet to grill with it, but that will come later in the week once the high temps and humidity pass. 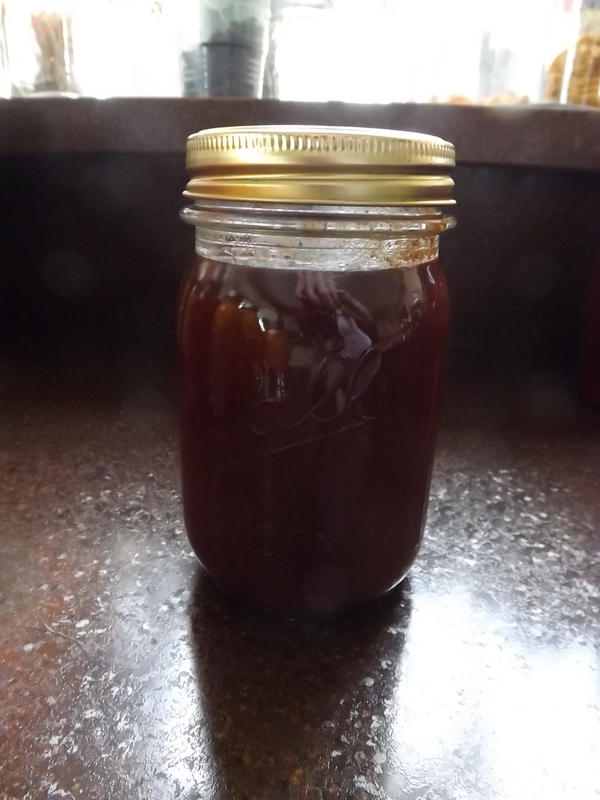 Put all above ingredients into large stock pot and cook down to consistency of thick barbecue sauce, about 3 hours. Use a stick blender to smooth out tomatoes and make sauce a spreadable consistency. The original recipe was able to be canned in a water bath for 15 minutes but because I changed the recipe so much, I have no idea if this is safe to can or not. I did process mine in the water bath for 15 minutes, but have it in the refrigerator. I’m sure it should be fine there for at least 6 months. Although I have no idea if this is going to be a keeper yet or not, I do love to try new recipes and can new things. If nothing else, I will chalk this up to experience and have something to base my next experiment in barbecue sauce on, and for this I am — Simply Grateful. Other than a handful of stragglers on the tree, plums are done here at our house for the year. Plum juice, plum pie filling, plum barbecue sauce, and asian plum sauce now stock the pantry. Of course now that I’m done with the plums, I’ve come up with a few other ways I could use more plums, but these will hold until next year. Of the new recipes I tried this year using plums the Asian plum sauce and plum barbecue sauce are the ones I’m not sure will be repeaters. The Asian plum sauce tasted pretty good, but the true test for this sauce will be on some homemade egg rolls. Combine all ingredients in stainless steel stock pot and bring to boil. Reduce heat and simmer 1 hour till sauce has thickened. Puree sauce till a fairly smooth consistency using a stick/immersion blender. Ladle into hot jars leaving 1/4 inch head space. Remove air bubbles and wipe rims. Place lids and rings on jars and process 10 minutes in water bath. I am anxious to try a jar of this with some egg rolls and Grace has been after me to unfreeze a few that I had left over last time I made them. Sounds like a great evening snack. This sauce isn’t like the sauce served in local restaurants with egg rolls, but as of yet I have been unable to find one anywhere on the Internet. Apparently, just like War Su Gai/Almond Boneless Chicken, this egg roll sauce is unique to Michigan. 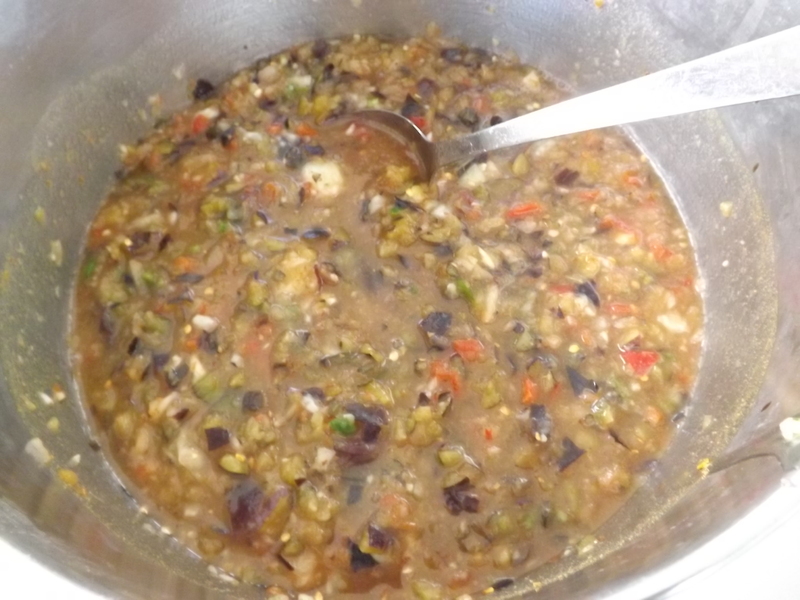 Similar to a plum sauce it is tangy and thin, with almost an oily consistency. Perhaps someday I’ll find a recipe for the original, but for now hopefully this one will be a close second. Plums are done for the season and I am relieved. Having so much fruit at one time to process can be overwhelming. I did lose some of the fruit before I could can it, but for the most part, all 80ish pounds got canned, and for this I am — Simply Grateful. I’m Just Steamed About Making Juice! Last year with 120 pounds of plums from our tree to contend with, I had to get creative in finding ways in which I could utilize every last one. 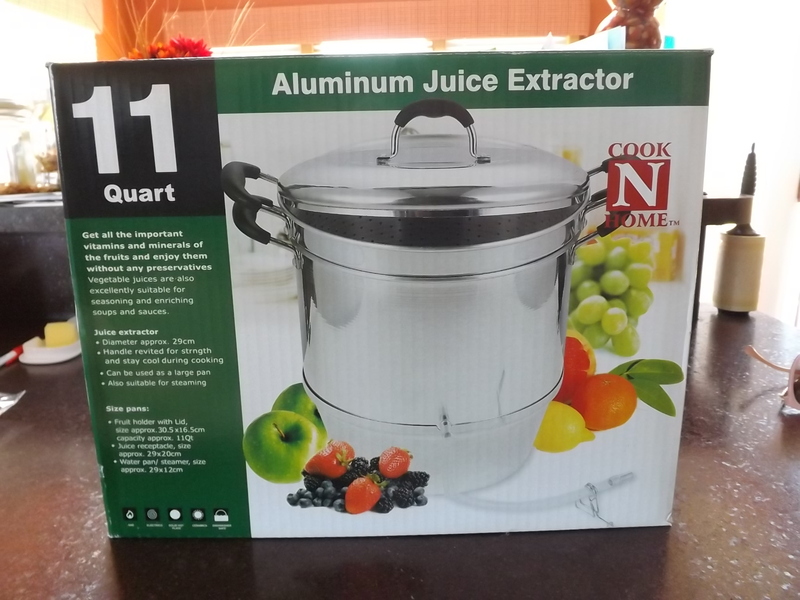 In researching various ways in which the plums could be used, I came across several people who had used a steam juicer to extract juice from the plums. The process looked easy and very quick. Knowing that plums would not be the only fruit I used such a gadget on, I decided to use a gift card from Amazon that I received for my birthday to splurge on this luxury. 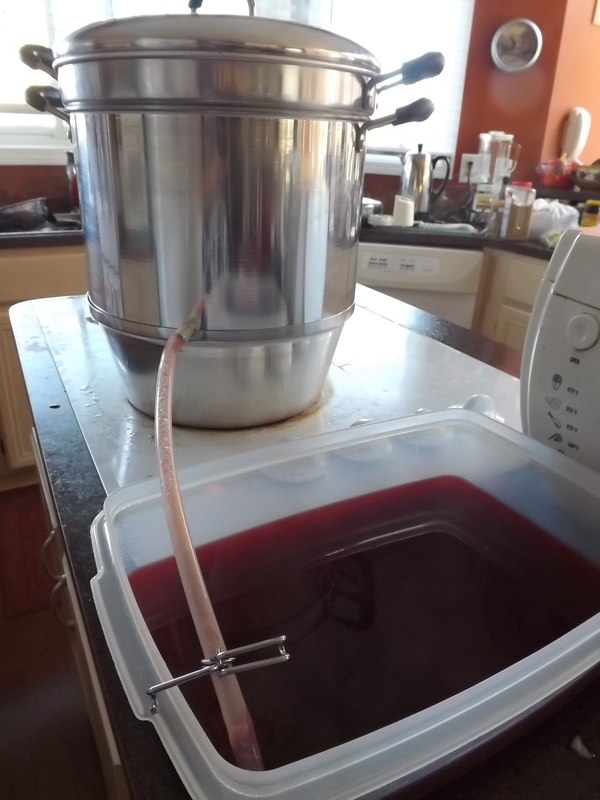 Three days later, I had my steamer and steamed my first batch of pure plum juice. Although quite tart, with just a little honey it turned into the perfect breakfast juice to serve the family. This year, although I have fewer plums, I also have fewer things that I need to make, as the pantry is still quite stocked with plum goods. Plum juice however is something I doubt I’ll ever have too much of. The process with a steamer is very simple. First slice plums in half, no need to remove the pits. 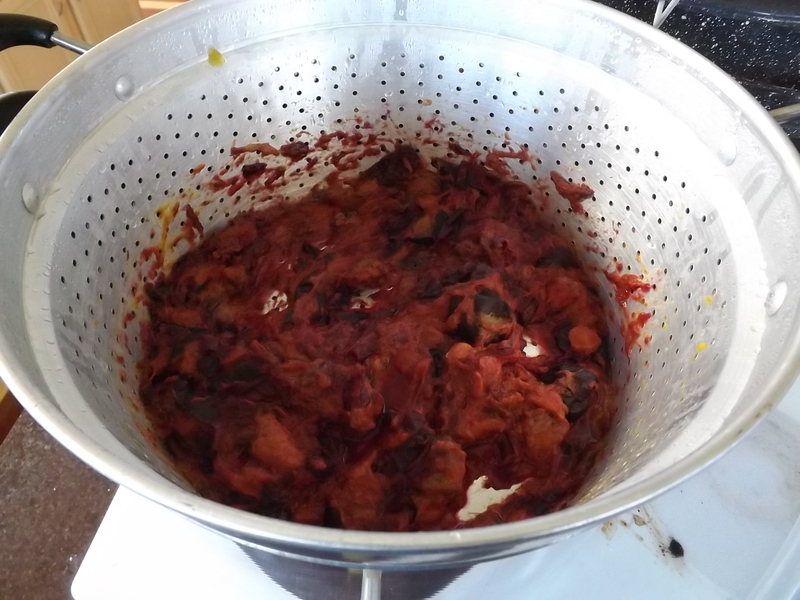 Place plums in basket portion of steamer. Fill bottom of pot with water nearly to the top, place the juice collecting portion on top of the water, the basket with the plums on top of that and top with the lid. Turn the stove on high. Within 15 minutes juice will begin to trickle down the tube, into a bowl. 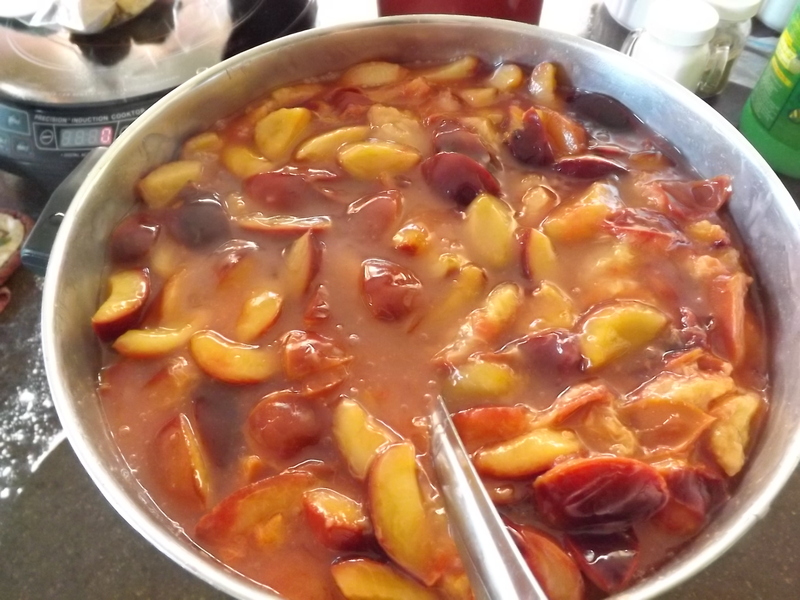 After about 45 minutes you’ll have a bowl full of filtered plum juice. I then mix in either 1/2 Cup of sugar per 4 cups or 3/4 Cup honey per 8 cups, heat till combined and pour into hot jars. Process this in water bath for 15 minutes and you’ve got plum juice to stock the pantry. Filling my steamer basket to the top with plums yielded me four quarts of juice. This is a great way to use some of the over-ripe and bruised fruit that you might not want to use in pie filling or jam. This year I’ve used under-ripe, ripe, and over-ripe plums and the combination has been successful. 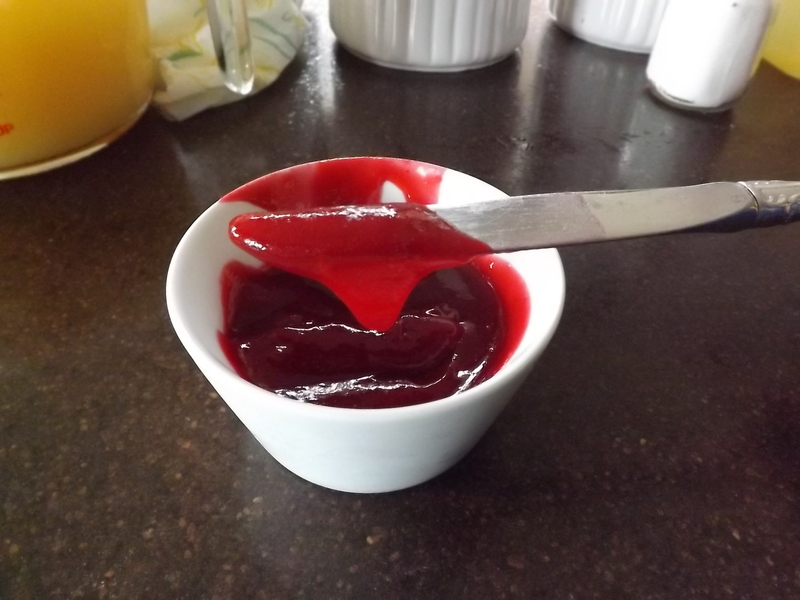 Now, if you want, you can use the pulp that is left in the basket to make plum jam or butter. It took everything inside of me not to use the pulp, but I could not justify making more jam or butter when there is plenty in the pantry and freezing it wasn’t an option, as every inch of freezer space is taken. If you plan on doing this though I suggest you pit the plums. Last year the first batch of juice I steamed I didn’t pit the plums and decided I wanted to use the pulp. It took me over an hour to pull out all the pits by hand. It would be easier to do prior to steaming. If you don’t plan on using the pulp leaving the pits in makes for a quicker process. Making sure that none of the bounty from our little tree goes to waste is important to me. We’ve shared them with our neighbors, given some to our parents, eaten our fill, and I’m still canning. After such a terrible winter and all the fruit crops that did not survive for 2014, I truly appreciate what we have been given, and for this I am — Simply Grateful. 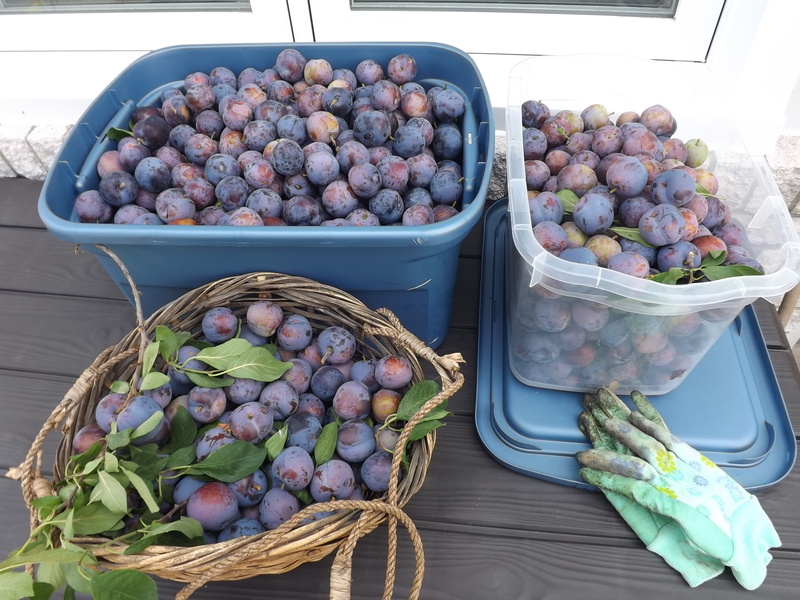 This morning I began the arduous task of canning the plum harvest we recently made from our abundant orchard. Okay, orchard might be a stretch, but abundant doesn’t begin to do our harvest justice. 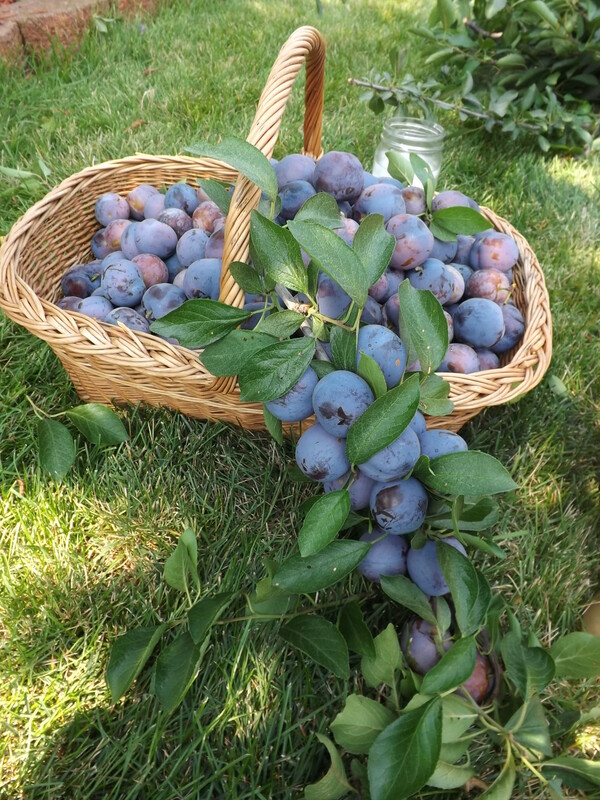 Although I am ever so grateful for the bounty our tree has blessed us with for the second year in a row, plums are by far the worst fruit to can — hands down. They are tedious and time-consuming, far more than peeling peaches, pitting cherries, or seeding strawberries. So far today I have washed, stemmed, pitted and sliced 10 pounds of the 80 to 90 pounds I have in buckets and it took me nearly an hour and a half. Being that they are not free-stone, pitting is almost impossible. Thankfully I learned a neat trick several years ago and use a melonballer to assist, otherwise I’d probably still be working on them. Last year I made plum pie filling and froze it. It was quick and easy, other than the pitting, but freezer space continues to be an issue, even more so now that I have peppers, tomatoes and zucchini taking up space. Hubby really needs to give some serious consideration to my request for a second chest freezer. I did my research and it would only cost about $55 a year to run. Until then, I’m going to can all my pie filling and store it in the pantry. Place slices in water containing Fruit Fresh to prevent browning. Bring large stock pot of water to boil. Place 6 cups of fresh fruit in boiling water and return to boil. Boil 1 minute. Drain and keep fruit in covered bowl. 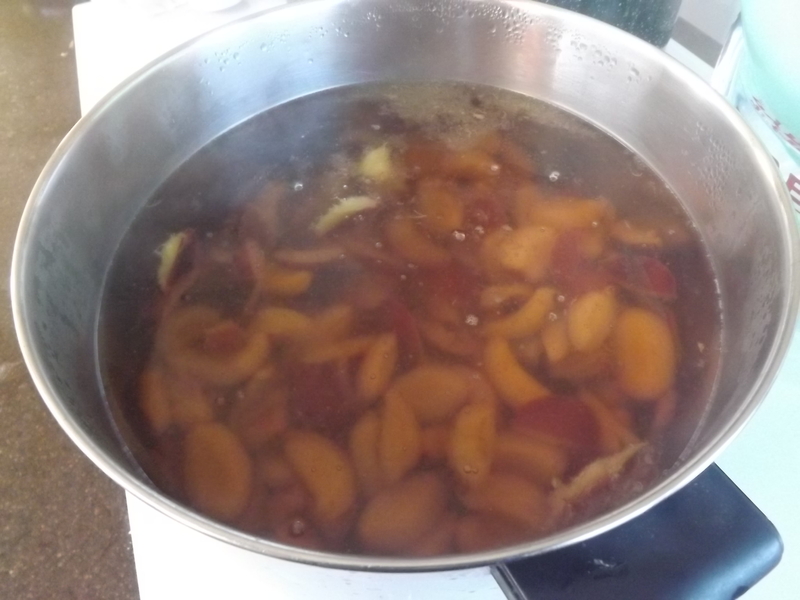 Continue until plums are all blanched. Combine water, sugar, and Clear Jel slurry in large stock pot. Bring mixture to boil over medium-high heat, stirring constantly, until mixture thickens and begins to bubble. Add lemon juice and boil 1 minute. Fold in plums. Fill hot jars, leaving 1-inch head space. Adjust and process in water bath for 30 minutes. After 30 minutes, let rest 5 minutes more in water before removing. This recipe made 7 quarts plus 1 pint of plum pie filling. One more batch and I should be set for the year. Ten pounds down and 7+ quarts in the pantry for the winter, for this I am — Simply Grateful. Today was the day! 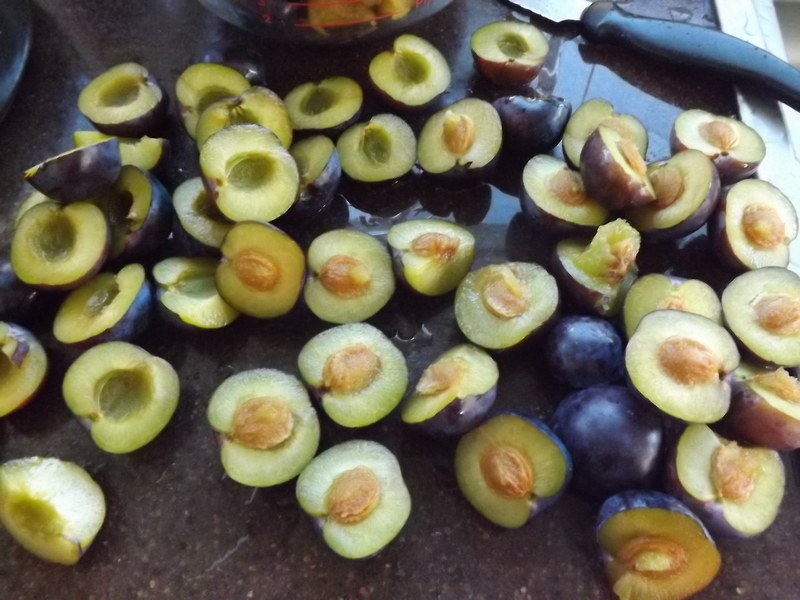 Yep, it was time to harvest the plums from our plum tree. It has been many months since the first flowers began to show on the barren branches that soon became lush with green and finally thick with plums. The plums were so thick again this year, that it was as if grapes were growing on our tree rather than plums. 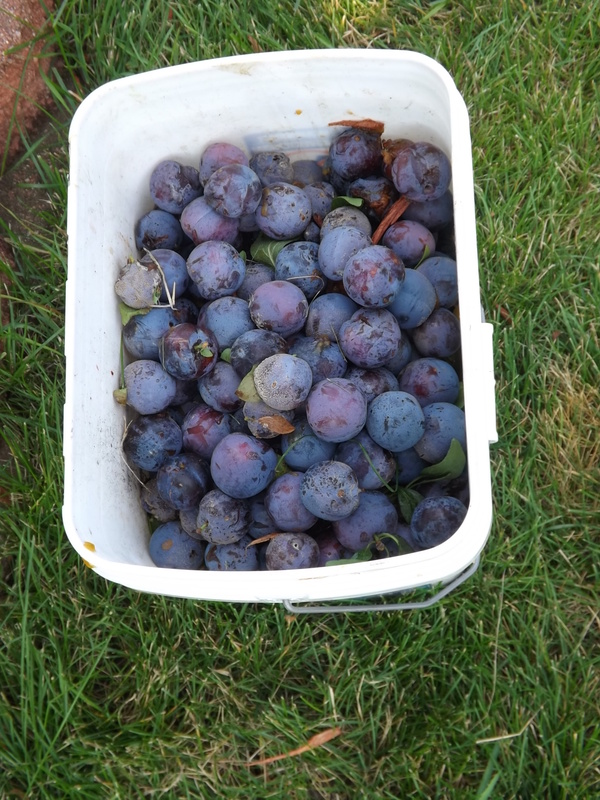 It took us several hours this afternoon to pick a good portion of our plums. 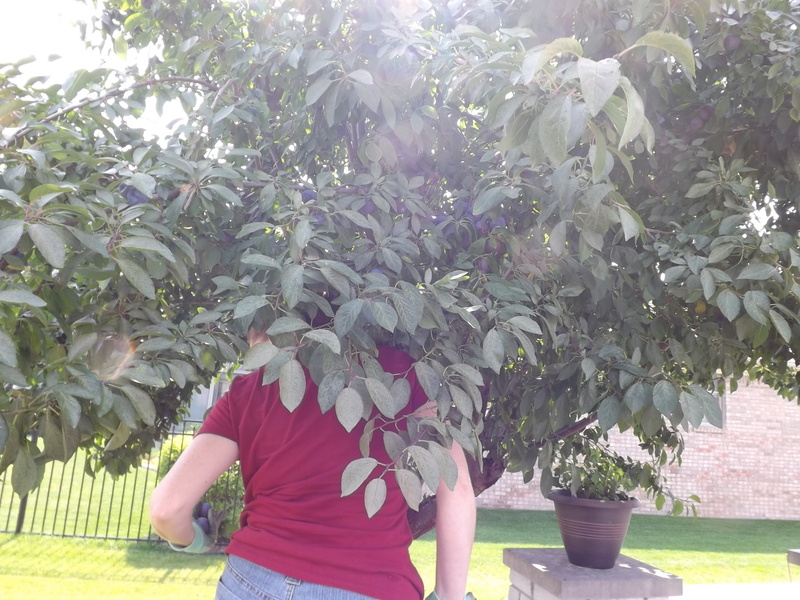 Here I am picking plums. NOTE: BOTH THE LADDER THAT HUBBY IS ON AND THE ONE I AM ON WERE PICKED FROM THE TRASH FROM NEIGHBORS IN OUR NEIGHBORHOOD. THEY STILL WORK! Even Grace joined in the harvest. Grace up the plum tree. And a whole bunch on the ground that required us to pick every one of them up and put them where they belonged. For awhile we picked the plums from the branches on the tree, but eventually Hubby decided that some of the branches had to come down, so he cut entire branches laden with fruit and dropped them down to us. In the end, we picked two full buckets of rotten fruit and nearly 90 pounds of usable fruit. I have my work cut out for me in the coming days. For now, I spent several hours this evening looking at every plum we picked and putting each into one of three categories: 1. Green 2. Purple but hard or 3. Ripe and ready to use. Most of the plums fell into the purple but hard category. We learned last year from picking over 200 pounds of fruit from our tree that waiting until the fruit is completely ripe makes for a difficult and overwhelming week of canning. 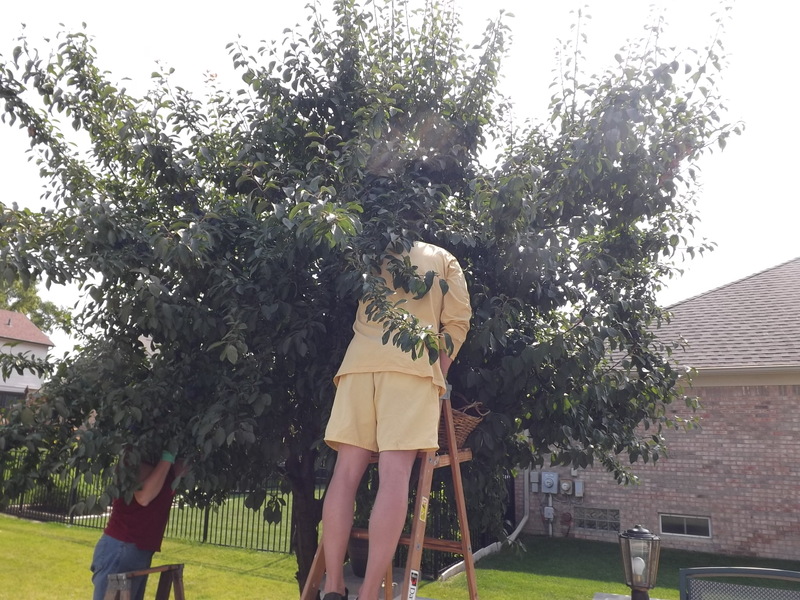 To avoid the race against time to can before the fruit spoils, we picked about 85% of the fruit today before it was completely ripe or rotten. 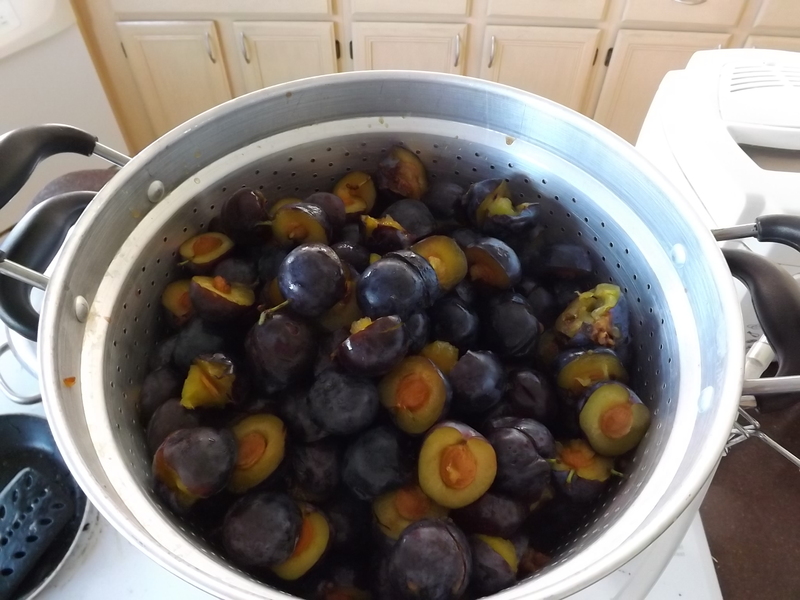 Canning will probably start in a day or two when the purple plums begin to ripen enough for me to start. Hubby ate at least a pound, took another pound to his parents, I gave about three pounds to a neighbor, and the rest are covered with a tarp on the patio (don’t want the kitchen to become infested with fruit flies). Pie filling, juice, and plum-cranberry sauce are on the list of things to can for the coming week. Lots of work, but lots of food to put in the pantry, and for this I am — Simply Grateful.